I’ve been zipping along the countryside for over a week now, having spent a few nights camping in Cavendish for the Horizons Unlimited adventure motorcycling event. My odometer reads over 3,000km, which includes the South Coast trip I did 6 weeks ago. The countryside here in Victoria is stunning. Lush green rolling hills, cattle, sheep, alpaca and roos. 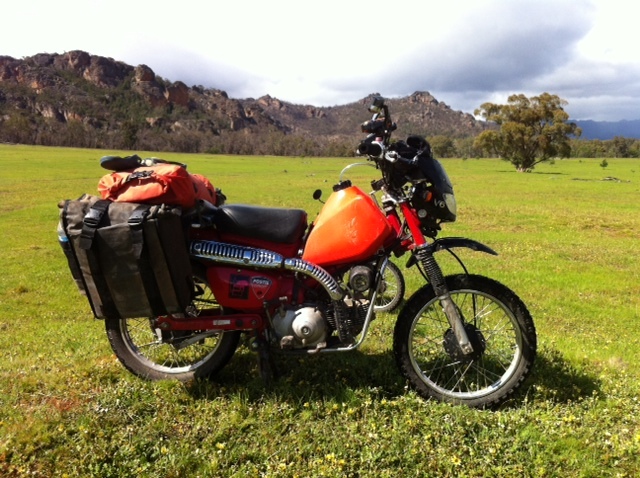 After two days of rainy weather and a failed attempt at climbing in the Grampians National Park, I joined forces with Guy and Tommo (pronounced Tom-O, in true Aussie fashion), who are riding their postie bikes around Victoria and making their way back down to Melbourne for another big motorcycle event. These two might be riding postal motorcycles, but they’re putting other riders to shame… Breakneck speeds, cornering like maniacs on the tiny dirt tracks, and slip and sliding in the sand. They’re both superb riders, and definitely teaching me a thing or two about off-roading. Here’s a link to Guy’s blog, complete with pics of my bike ‘taking a little nap’. After all day showers along the magnificent Great Ocean Road, we turned down a winding road towards Cape Otway Lighthouse in the Otway National Park. The smell of the eucalyptus forest soothed the senses and calmed my soaked nerves. 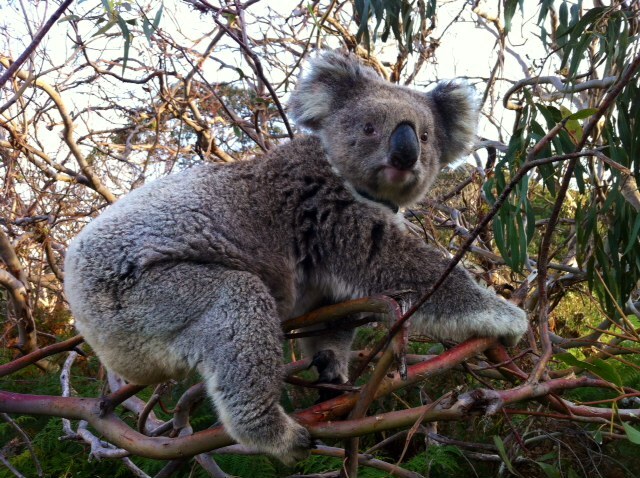 It was hard work keeping my eyes on the road though, as I heard this region was well known as a koala-haven. 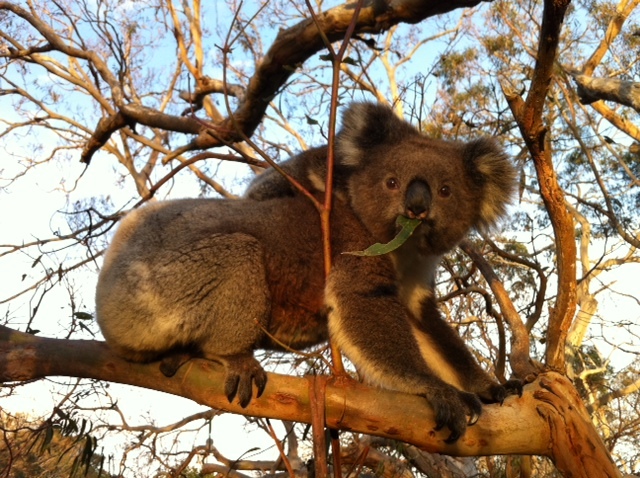 That evening, from the dining room table of the spacious two bedroom cottage we rented, I could see koalas hanging out in the eucalyptus trees, munching away, cuddling their young, or just snoozing. Mothers swatted away at the attempts of big males as their babies clambered to safety higher in the canopy. Going on an evening stroll, I found so many within reach you’d think I was in an animal reserve. They look cute and docile, but I was warned that if I tried touching a wild one, I might have my hand clawed off. I resisted the urge to touch and enjoyed the scene instead, marvelling at the way they moved and clung to the tiniest of branches. It was a warm Spring night, the moon guiding me through the woods as I listened to the loud calls of the animals, finding my way back to the cabin.